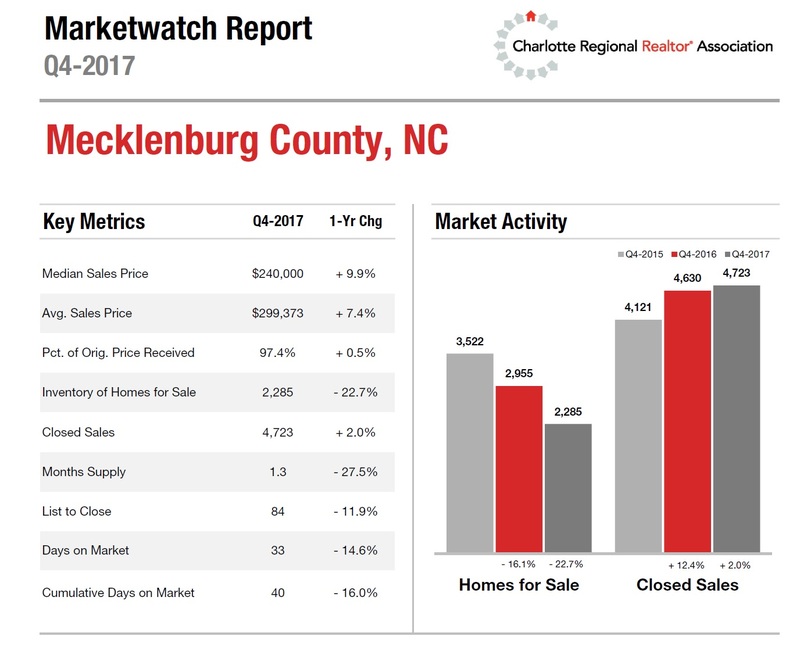 What Happened In Charlotte Region's Housing Market: 4th Quarter 2017? 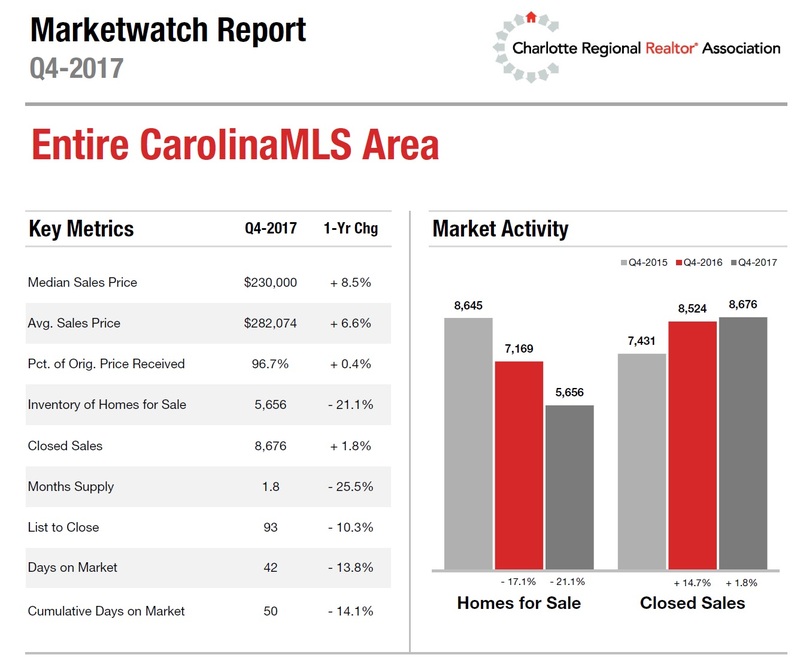 Fourth quarter 2017 Charlotte, North Carolina region's home sales continued the positive trends we've seen all year and since 2015. Home buyers are finding the housing market very competitive with higher home prices and a lack of properties to buy. Buyers looking for a bargain are "hard pressed" to find one. Meantime, home sellers are seeing their homes sell quickly and for top dollar, when priced right for condition and location. The "story" of the fourth quarter 2017 might well be about the double-digit decrease in the supply of homes available for sale across the region, except that it's now an old story, because that was also the story of 2016. 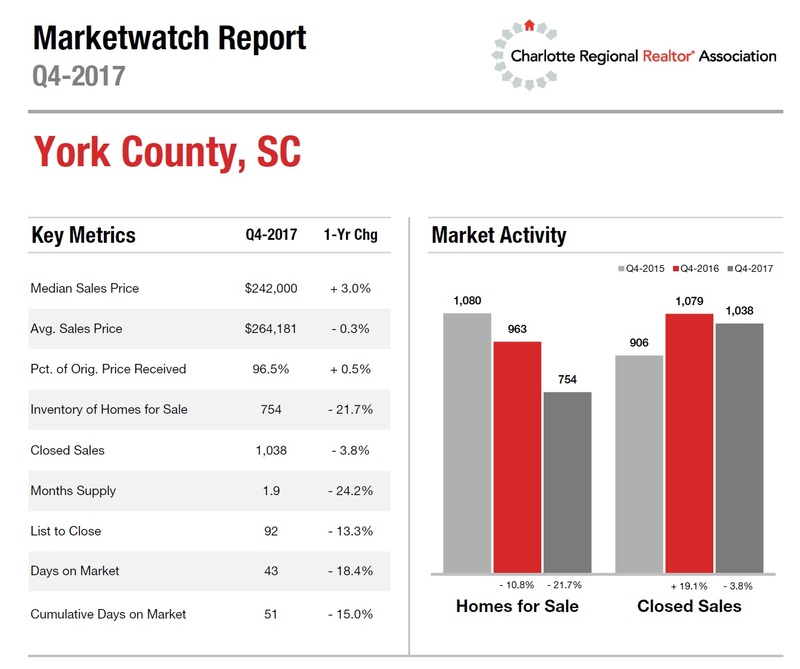 The "main" story in four of the most populated and in-demand counties (Mecklenburg and Union Counties in North Carolina; York and Lancaster Counties in South Carolina) in the Charlotte region is the lack of inventory of homes for sale, which has dropped in double digits. Mecklenburg County had only 1.3 months of inventory at the end of the fourth quarter. 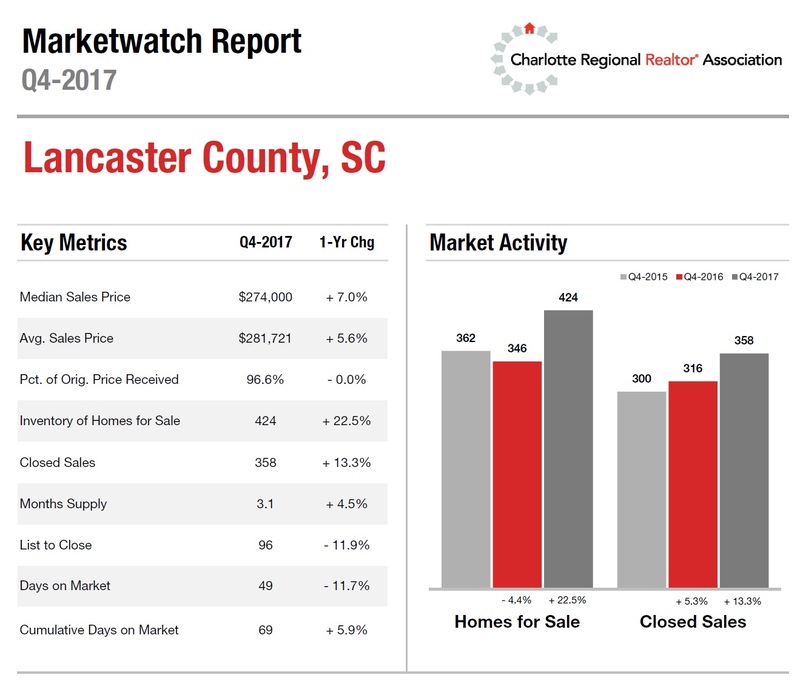 Union and York Counties had less than 2.2 months of inventory, while Lancaster County had 3.1 months of inventory. It's clearly a seller's market in these four Charlotte metro area counties and the lack of inventory to meet demand continues to be "the story of the day." The lack of inventory is also impacting home prices, dampening sales, and affecting affordability. Average Sale Price: up 7.4% versus one year ago. Inventory of Homes for Sale: down 22.7% versus one year ago. Closed Sales: up 2.0% versus one year ago. Months Supply of Homes for Sale: 1.3 months, down 27.5% versus one year ago. Average Days on Market: 33 days, down 14.6% versus one year ago. Average Sale Price: down 1.1% versus one year ago. Inventory of Homes for Sale: down 13.0% versus one year ago. Closed Sales: up 7.6% versus one year ago. Months Supply of Homes for Sale: 2.2 months, down 11.8% versus one year ago. Average Days on Market: 46 days, down 12.3% versus one year ago. Average Sale Price: down 0.3% versus one year ago. Inventory of Homes for Sale: down 21.7% versus one year ago. Closed Sales: up 3.8% versus one year ago. Months Supply of Homes for Sale: 1.9 months, down 24.2% versus one year ago. Average Days on Market: 43 days, down 18.4% versus one year ago. Average Sale Price: up 5.6% versus one year ago. Inventory of Homes For Sale: down 22.5% versus one year ago. Closed Sales: up 13.3% versus one year ago. Months Supply of Homes for Sale: 3.1 months, up 4.5%. Average Days on Market: 49 days, down 11.7% versus one year ago. Seems like it was a pretty healthy 4th quarter, but of course I would rely on you to tell me what is really going on! Hi Nina Hollander, homeowners thinking about selling would be very happy with your reporting. Those looking to buy or sell a home in the Charlotte area would be in great hands with you as their REALTOR®. Paul S. Henderson, REALTOR®,CRS, ~ hi Paul... unfortunately I get virtually NO response to market reports.... really thinking about how much I want to waste time doing them. Endre Barath, Jr. ~ hi Endre... the price point difference between Charlotte and Beverly Hills would be huuuge! Gita Bantwal ~ good Friday morning, Gita.... thanks for stopping by. Wishing yo a lovely weekend. Beth Atalay ~ hi Beth... thanks for this great vote of confidence! Here's wishing you a great weekend. Brian England ~ hey Brian... I just did tell you.. it was an excellent fourth quarter! Big decrease in inventory Nina. Unfortunately, we're seeing that happening here too. Buyers have to be ready when new inventory appears. Lawrence "Larry" & Sheila Agranoff. Cell: 631-805-4400 ~ hi Sheila and Larry... this is a big decrease for a third year in a row.... and buyers not only need to be ready to buy, they need to be ready to pay more. Nina, very in-depth and valuable report for the 4th quarter's sales in Charlotte. Joan Cox ~ good morning, Joan... thanks. I was surprised to see how much sales were dampened by the lack of inventory. Scott Godzyk ~ hi Scott... sorry to hear about the scrambling on AR. I deal with that on my own posts more often than I'd like to. As for the weather... it's a veritable heat wave at your end! It will push 70 degrees here in Charlotte today. Love your charts, make the information easy to understand. Hope you get plenty of calls from those wanting to list in this low inventory market. Nick & Trudy Vandekar, 610-203-4543 ~ hi Nick... in all these years I've yet to ever receive a phone call from a lead from one of my market posts... really beginning to think they might be a waste of time. Debb Janes EcoBroker and Bernie Stea JD ~ thanks, Debb... the real problem is that the new adventure to move on to is an impossible task to finding a new home. That's why sellers are sitting tight.